Full set of all 13 cards 7 x 5 in. A set of thirteen B/W Notecards with line-drawings by Robert Beer, which depict some of the most important Indian and Tibetan Buddhist lineage holders and gurus. The Notecards come with envelopes, and have a short biography of the lineage master depicted. Priced at £0-70 each, or £5-95 for the full set of thirteen. 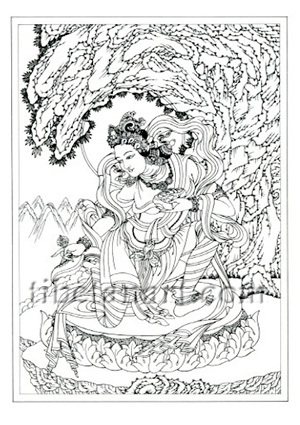 Yeshe Tsogyal was the foremost female disciple and spiritual consort of the great Indian tantric master Padmasambhava (Guru Rinpoche), who consolidated the advent of Buddhism in Tibet. Together they practiced and traveled throughout the land of Tibet, giving teachings, consecrating countless sacred sites, and concealing hidden teachings (terma) that would be discovered in future generations.